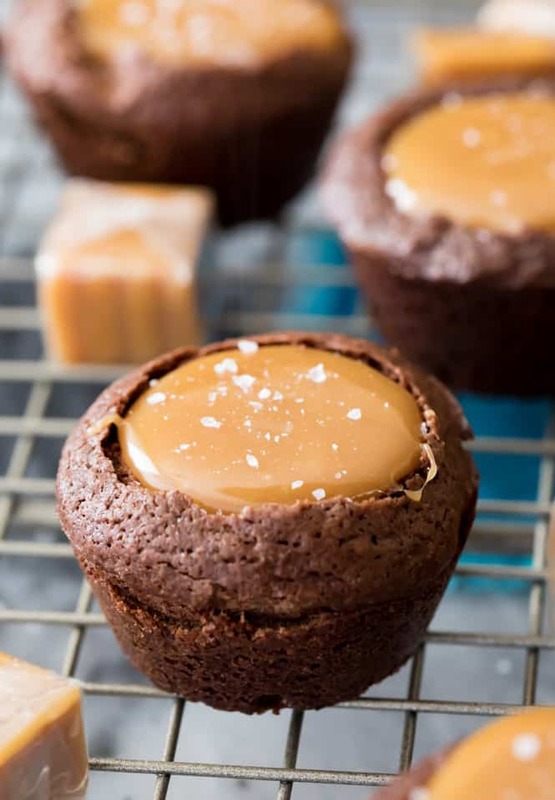 These Salted Caramel Brownie Bites are made with a simple, from-scratch, brownie batter and are filled with a rich (easy to make!) caramel filling! Top everything off with a sprinkle of flaky sea salt for a dessert you’ll be coming back to over and over again! 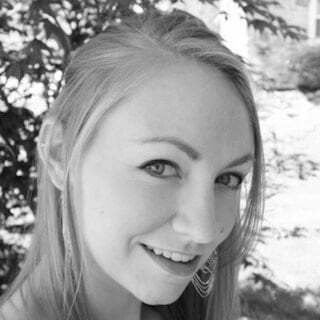 Hi everyone, Sam here again from Sugar Spun Run. Today I have yet another sweet treat to share: these absolutely irresistible, decadent, Salted Caramel Brownie Bites! Brownies have always been one of my favorite desserts, but I’ve recently found that they’re even better (and quite a bit more addicting) in bite-sized form. These brownie bites are great on their own and I’ve been making them for forever, but they’re even better when filled. In the past I’ve filled them with cream cheese frosting or peanut butter frosting (both are fantastic options! ), but filling them with creamy salted caramel is my current favorite. 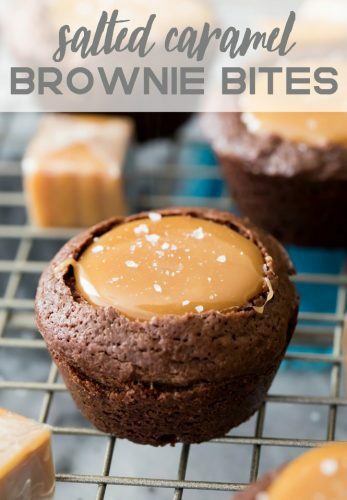 The caramel for these brownie bites is super easy to make. For today’s recipe, you’ll simply be melting down caramel candies and heavy cream. I like to combine my caramels and my cream on the stovetop and melt the caramel on low heat, stirring frequently. Keep stirring until the mixture is completely smooth. If you don’t want to use pre-made store-bought caramels, you can use a homemade caramel sauce, just keep in mind that this sort of caramel sauce won’t firm up quite as much as the version included in this recipe. Whichever caramel you use, make sure you let it cool completely before biting in — nothing ruins a great dessert quite like scalding yourself with scorching hot caramel (ask me how I know!). Stir in cocoa powder, instant coffee, and sugars, then add eggs, egg yolk and vanilla extract and beat well. Drop batter by 1 1/2 Tablespoon into prepared mini muffin tin. Immediately after baking take a rounded teaspoon or Tablespoon and press into each brownie bite to make a well (see photo in post for example). 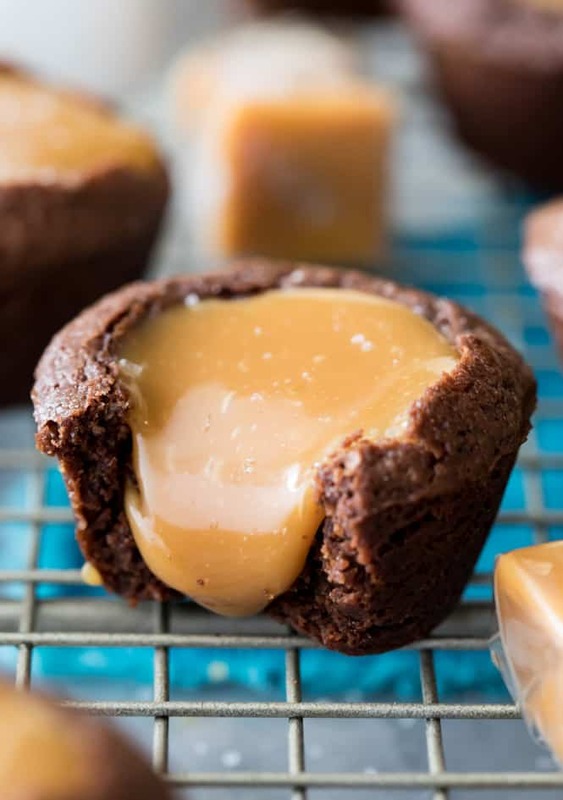 Allow brownie bites to cool while you prepare your caramel filling. 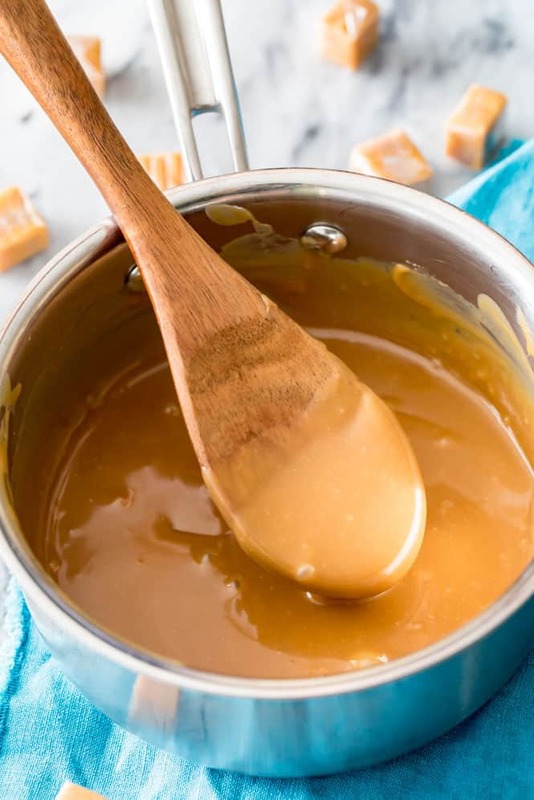 Prepare your caramel filling by combining caramels and heavy cream in a small saucepan over medium-low heat. Stir frequently until caramel is completely melted and mixture is smooth, then remove from heat. Use a spoon to pour melted caramel into each brownie bite. Sprinkle with sea salt and allow to cool completely before serving. **Baking spray is not the same as standard cooking spray. Baking spray should have flour listed in the ingredients, this will keep your brownies from sticking. I've found that if I use regular cooking spray I can't get my brownies out of the tin. If you don't have baking spray you can lightly grease and flour the sides and bottom of each mini muffin well (make sure to shake out excess flour). The caramel brownie bites were amazing!!! They won’t last in my house, have to make two batches next time. Amazing!!! These were fabulous! I made them for a group dinner tonight and I was hoping there would be at least one for me to take home but nope, they were all gone! Very rich tasting and the caramel was soft and gooey with just a touch of salt. Will definitely make these again!